"In probability theory, the normal (or Gaussian) distribution is a very commonly occurring continuous probability distribution—a function that tells the probability that an observation in some context will fall between any two real numbers. For example, the distribution of grades on a test administered to many people is normally distributed. 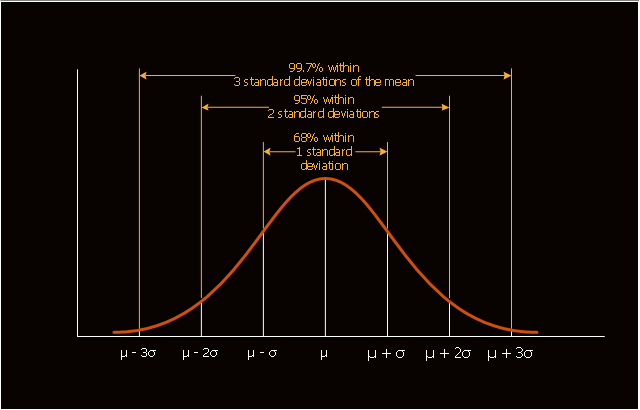 Normal distributions are extremely important in statistics and are often used in the natural and social sciences for real-valued random variables whose distributions are not known. This normal distribution chart example was created using the ConceptDraw PRO diagramming and vector drawing software extended with the Marketing Diagrams solution from the Marketing area of ConceptDraw Solution Park. The Normal (or Gaussian) Distribution is a continuous probability distribution that is often used as a first approximation to describe real-valued random variables that tend to cluster around a single mean value. 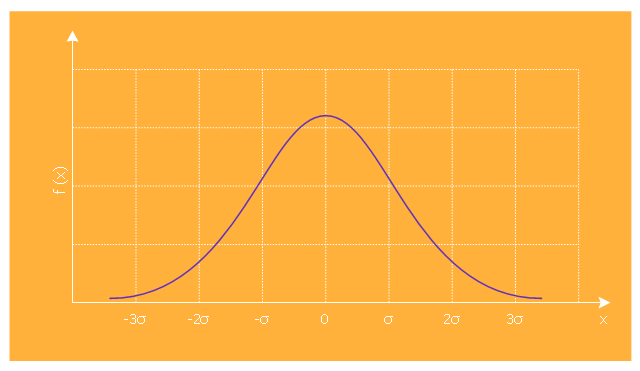 The shape of the Normal Distribution resembles that of a bell, so it sometimes is referred to as the Bell Curve.